The 11km coastal trail that links the five towns of the Cinque Terre is now part of the fairly bogus Cinque Terre National Park (www.parconazionale5terre.it), established largely so they could start charging admission to walk the old goat paths thus milking the thousands of tourists who've discovered the area in the past decade. That said, the increasing crowds—and infuriating ticket fee (get the pass that includes unlimited train rides)—don't make the hike from one village to the next any less gorgeous. 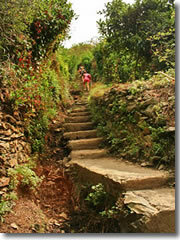 You can do the hike—now named the Sentiero Azzurro, or Blue Trail (sometimes marked as "no. 2")—in five or six hours, but most people take two days and make it more of a leisurely stroll, stopping for long lunches and pausing at cafes. Note: The floods of October, 2011, washed out sections of the these trails. Officials expect to have the main path fully reopened by Easter, 2013. The trails linking the five villages—especially the rugged Vernazza-Monterosso section—offer a wonderful and rewarding mix of environments and scenery. Nearest the towns, kitchen gardens that feed the local markets overflow with long striped squashes tipped with orange flowers destined to be filled with ricotta and an anchovy, batter fried, and served as an appetizer; lemons bob on breeze-tickled tree branches; vines dangle tomatoes, and red, green, and yellow pepper bells hang like Christmas ornaments. Then come terraces regimented with DOC grape vines or gnarled old olive trees that flicker dusty silver and waxy green whenever a slight wind kicks up their leaves. When the grape harvest of September gives over to the olive raccolta of October, green, white, and orange netting is stretched between tree trunks to create a vast safety net for any olives that might slip through the gatherer's fingers. If they hit the ground, they'll bruise. If they bruise, it'll raise the acidity level of the resulting oil. Only oil less than 1% acidic can be called "extra virgin." Once you rise above the houses and fields, the wilder growth takes over. Miniature twisted trees called arboreal euphorbia. Ruffle-necked palms lord over pointy bursts of punk hairdo yucca. Lonely Aleppo pines rise above heather and scrubby macchia bushes. Twelve-foot lances of agave cactus thrust at crazy angles out from cliff edges, destined to flower once, then die (I can't seem to convince the locals to try to turn the things into Italian tequila). Short prickly pears scrabble along rocky hillsides to proffer dark purple fruits at the ends of spiny green paddles. Overall, it all seems harsh, green and brown—until you stop to look closely. Then, wall vines dangle small grappole bunches of ruby red berries and tiny violets grow in the ancient cracks of walls. Overhanging bushes are frosted with tiny lavender bells; ankle-high stalks wave their little pink, yellow, or red fireworks invitingly to the bees. Various cornflowers sprout as little yellow-tipped shoots or clusters of pink sea urchins. Canterbury bluebells dance on the trail's edge, and Ligurian lavender cotton sprouts pale lemon puffs along the tops of walls. And always in the other direction sparkles the sea, in turquoise and green washing in hoary wave lines over tan and pale gray underwater shoals, the all of it shading into a deeper blue as the waters stretch out toward distant Corsica. Most important fact to know about hiking the Cinque Terre: The trails from town to town get progressively steeper and more challenging as you move north. 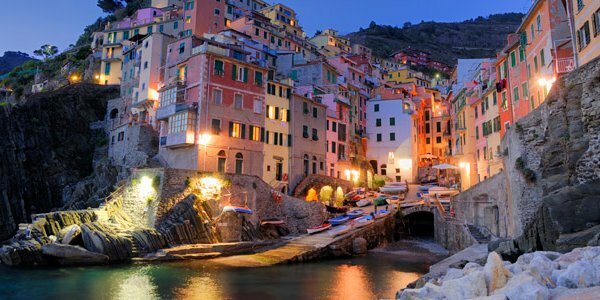 Riomaggiore to Manarola (1km/0.6 miles; 45 minutes): It starts with an easy stroll along the Via del Amore ("Love Way") between Riomaggiore and Manarola. Exiting the Riomaggiore train station, there a park office headquarters just to your right (and, beyond that, a tunnel leading into the center of town). Manarola to Corniglia (2km/1.2 miles; 1 hour): The path above a beach of large pebbles (or small boulders, take your pick) between Manarola and Corniglia is largely level. However, it ends with a formidable, switchbacked staircase of nearly 400 steps up to Corniglia (the only clifftop village of the five). Note that, even if you take the train, you still have to climb this staircase, as the station is down near the water. Corniglia to Vernazza (4km/2.5 miles; 90 minutes): It gets tougher but more picturesque from here, a scenic mix of moderate-to-tough trails between Corniglia and Vernazza (the postcard village of the bunch, its stack of pastel houses curved around a cove beneath a pirate lookout tower). Vernazza to Monterosso (3km/2 miles; 2 hours) : The northernmost trail is the most challenging: a steep ascent and descent over the ridge between Vernazza and Monterosso al Mare, northernmost of the Cinque Terre and the only one with a proper, sandy beach (and a big parking lot and commensurate crowds of Italians). Or, you know, vice versa. You can hike it either way. 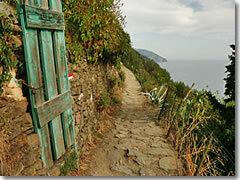 Tackling the hardest part: the trail between Monterosso al Mare and Vernazza. (Photo by Barbara Ann Weibel. )My vote: If you're feeling fit enough (and after a few days or weeks of vacation gorging on Italian food and wine, that might not be a given), start with the hard part and hike Monterosso to Riomaggiore. Take the train all the way to Monterosso and start the morning with the two difficult, workout stretches. Besides, coming in this direction, the first view of Vernazza as you come around the cliff is unforgettable (and if you do forget, it's plastered on postcards everywhere). Also, this way lets the going get easier as the day winds down, allowing you to finish with a sunset stroll back into Riomaggiore. And that's your other option: Riomaggiore to Monterosso. If you're unsure whether you can handle all this hiking, you can always start easy, strolling the Via del Amore from Riomaggiore to Manarola, then keep going from there. If you find that the going is getting too tough for you, you can always bag it and hop the train for the final stretch or two. Isolated from the rest of Italy by the impressive landscape, you're here to hike. 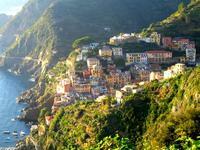 The rugged villages of Cinque Terre still remain a world away from the bustle of Rome. Follow coastal trails and discover villages clustered on windswept cliffs and perched above beautiful coastlines. Hike and swim by day and sample the fresh seafood and local delicacies by night. For the active traveller who wants to experience a real slice of Italian life, this compact adventure tops the menu. If you're just hitting the trail for a day and want to store your bags safely while you hike, there's a deposito bagagli (left luggage) at the train station-adjacent tourist office in Riomaggiore (tel. +39-0187-920-633). It's open 8am to 8pm; bags cost €0.50 per hour each.